Pita is the quintessential bread of Middle Eastern cuisine. It's a soft, lightly leavened bread that's similar to naan and flatbread. Pita, however, is baked at a higher temperature which causes the dough round to puff up and leave the well known pocket. So, while naan and flatbreads are great for rolling, topping or dipping, only pita can be stuffed. We probably think of pita most often as vehicle for falafel. The crispy balls are stuffed inside the pita pocket along with salad and then drizzled with tahini sauce. 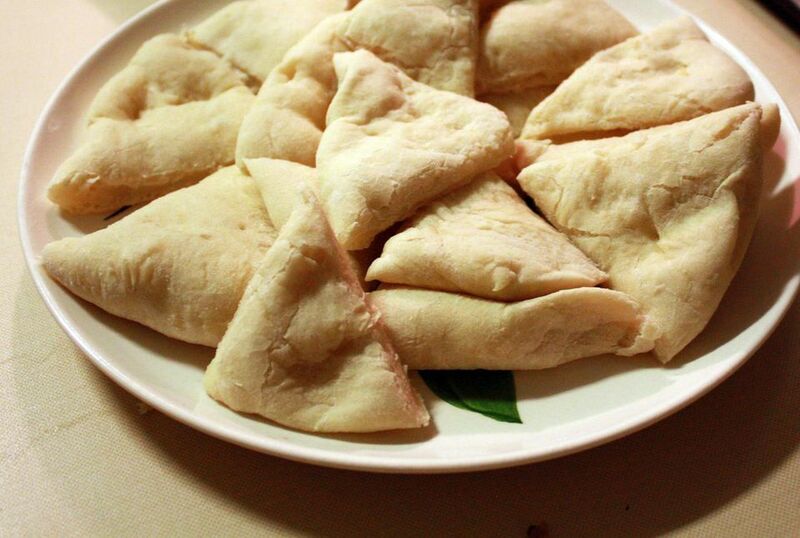 But pita is a delicious and versatile bread that can be used in lots of ways. Here then are some ideas for fun new ways to add creativity to your pita bread usage. Toast pita bread in the oven or under a broiler. Cut into triangles with a knife or a pizza cutter, and serve with dips like hummus or baba ghannouj. Pieces of pita can be used as a spoon for bean dishes like ful medammes, or for finely chopped salads like tabouleh. This is a fun way for kids to eat! Throw some sauce, cheese and your favorite pizza toppings on pita bread and bake it in the oven until the cheese is melted. This is similar to english muffin pizzas. Toasted in the toaster or oven, pita bread can make a more filling alternative to regular toast. Spread jam, butter, hummus, or your favorite spread for a light breakfast or snack. These are great for kids who don't like crusts. Spread the peanut butter and jelly inside the pocket. You can also microwave the sandwiches for 15-30 seconds for a warm sandwich. Pita bread has a pocket for a reason - to hold food! Fill a pita pocket with your favorite salad and veggies. You can also include strips of meat like steak, chicken or lamb. Tahini makes a great sauce for a pita pocket sandwich. Instead of using traditional hot dog buns at your next cookout, wrap the hot dogs in a small pita bread. Pita can also be wrapped around kofta, a delicious food with ground beef and herbs. Grilled cheese, sloppy joes, or submarine sandwiches are all tasty on pita bread. Wrap them or fill them, they make a very nice alternative to white bread. Where Can You Buy Pita Bread?